We too have thought about Maestro Marchesi. In consideration of the moment of crisis, we have eliminated the gold and replaced it with the colour of copper and the brilliance of the Mediterranean. Make a traditional risotto, toasting the rice with the onion and seasoning it with salt. After cooking with a little wine, cover it with the stock and leave to cook for about 10 minutes, adding the saffron pistils. When cooked, stir off the heat and season to taste with butter, cheese and lemon, adding salt if necessary. 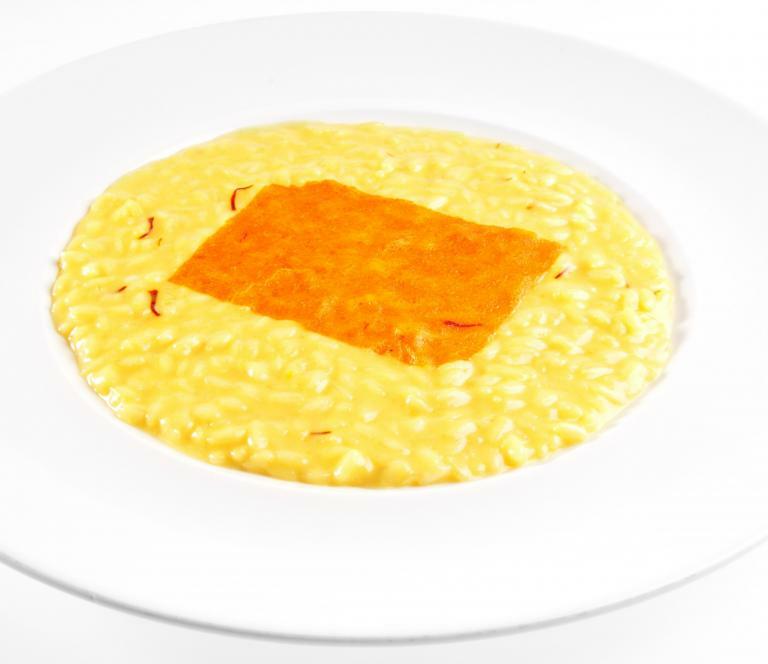 Spread the creamy risotto on the plate and decorate it with a piece of red pepper film, obtained by placing the blended boiled red pepper, dried apricot, water and salt on a silicone sheet in the oven.